= Echinopsis jajoiana f. cristata hort. Description: The standard columnar Echinopsis jajoiana (commonly known as Lobivia jajoiana) is a small cactus that usually grows solitary or in groups that is very popular and widely grown for its peculiar dark throated flowers. 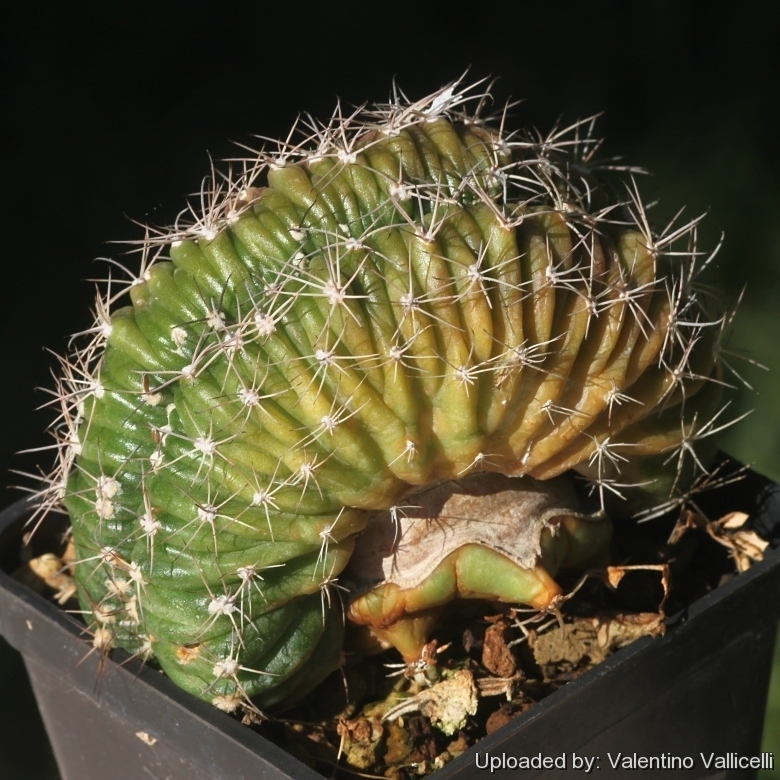 The beautiful crested form here depicted is still rare in cactus collection. Spines: Of different length, usually straight or slightly bent, directed upward, dark brown to blackish in youth, later grey. Central spines: 1 to 3, strong, dark, frequently red; the upper spine usually attains a length of 3 cm and is often hooked and thickened basally (but often shorter and not hooked). Flowers: Arising from the basal tubercles on the side of the plant, up to 7 cm wide, their colors is very variable, going from yellow to orange, tomato-red, vine-red and also happening through all the imaginable tones of violet. All of them have in common that the hymen (or throat ring of the flower) is always of a very dark purple-violet to black, thickened at the edge and glossy. The stamens are purple, the anthers yellow.